The Arcader Slot from Thunderkick merges old-school arcade gaming. 1980’s design and a heavily retro soundtrack with the modern 15 pay line online slots platform. Thunderkick, a fairly young games development company has built a potential classic. Packed with free spins, a mystery bonus game and expanding sticky wilds to redefine the pixel-powered genre. Arcader is a 15 pay line arcade-themed slot. It regenerates the dated world of pixelated gameplay for the modern online casino landscape. Arcader features a 2000 coin jackpot, pays out using a 96.1% RTP metric and offers up to 9 x multipliers on wins gained from free spins. Like Bird on a Wire, Arcader is built by Thunderkick Software showcasing the developers impressive visuals and sound like never before. Using retro bitmapped graphics, a Tron-like sound score and robotic voice overs on wins. Arcader merges cash play casino with the classic arcade stereotype vision. You can play Arcader on mobile or desktop and from as little as 20p per spin or in a free play demo mode. 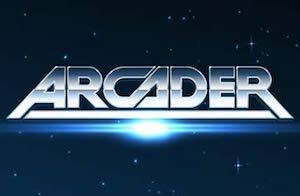 If you remember the age of arcades, coin-op games machines such as Space Invaders, Asteroids, Pac-Man or Donkey Kong, then you might appreciate Thunderkick Arcader. 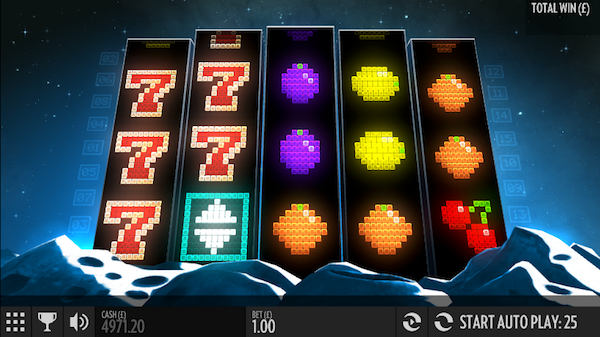 The new 15 pay line online slot hitting UK casinos with its retro visuals and gameplay. Fans of the genre with love it, but there’s something for newbies too. The Arcader Slot might look dated (8-bit intentional), but there’s some decent software tech underneath. Betting limits stretching from 20p to £100 per spin for cash players, free spins with added multipliers, expansion symbol and a mystery bonus game. If the Arcader Slot by Thunderkick delivers one thing better than anything else, it’s an atmosphere. UK casinos are looking for games that stand out. Slots that don’t repeat the mould too much and carry appeal. Arcader on playability is already bearing these hallmarks and using free spins, multipliers on wins, sticky wilds and mystery game in this 1980’s environment works well. Playability can be exciting for cash play. Although young as a developer, Thunderkick Slots are proving popular with UK casino players. This is because they look good and feel even better. Slotsquad tested the Arcader mobile slot on multiple IOS and Android devices. In its mobile variant, Arcader is impressive while downscaled and offers simple user controls. Graphically the game is strong, and most modern devices will show Arcader in its best light while sound will need good speakers for best results. The Arcader Slot for desktop is better again. In keeping with 1980’s tradition and opting to use retro fruit machine symbols, Thunderkick has pixelated the Arcader Slot pay table in 8-bit detail that lends enormous arcade credibility to the game. If you’re playing Arcader for real money, there’s a decent paytable awaiting luckier spinners. Symbol value depending on current bet ranges from low-end Cherries worth 100 coins to high-end Bar icons at 2000 coins (also the games jackpot). In between, pixelated lemons, plums, melons, 7’s and bells fill the void with payouts of up to 150 coins to 900 coins if playing at the maximum stake. 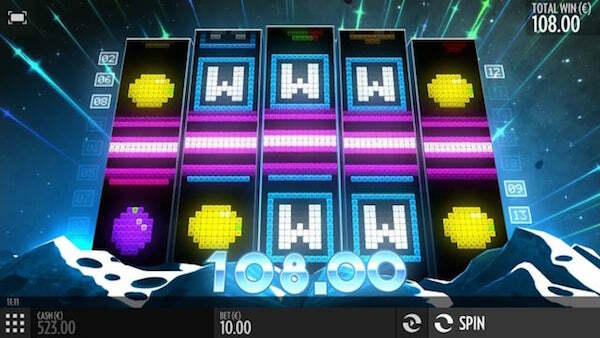 Arcader Slot Bonus Symbols include the standard Wild “W”, the Bonus Game “B”, Sticky Wild “Green W” and the Mystery Game “M”. The slot also uses an Expansion symbol that can fill the entire reel with the best paying symbol. If the cyber world of Tron played online slots for cash bets, it would be Arcader taking those chances. Thunderkick’s arcade revisit is feature full and includes a number of ways that players can rack up wins alongside standard Arcader Slot paytable wins. During the base game, players could find the Standard Wild “W” appearing stacked on the reels and ready to help build winning combos. An Expander Symbol is also in play boasting the capability of expanding to complete entire reels for best potential wins. The other of the two feature games is the bonus round or the Arcader Free Spins Bonus Game. Activated with three or more “B” symbols, players can win up to 9 free spins with a 9 x multiplier as the best possible payout on wins. Each free spin comes aligned with a possible Sticky Wild on the three inner reels that can also help to gain wins. The Arcader Slot is a 15 (fixed) pay line video slot with a betting range of 20p to £100 per spin. 5 Bar Symbols pay the games jackpot of 2000 and 96.1% RTP governs Arcader’s theoretical payout rate on cash wins. UK slots players looking towards the future in 2016 for big wins might want to look backwards. The lost Arcade generation has a new lease on life thanks to Thunderkick’s 1980’s 15 pay-line blueprint and a new home in those top online casinos that a know a good game when they see one. The Arcader Slot for mobile or desktop is a mission to make money for the luckiest of us and a cool throwback slot for everyone else.